Herculaneum is the second largest town after Pompeii that was destroyed during the eruption of Vesuvius in 79 AD. 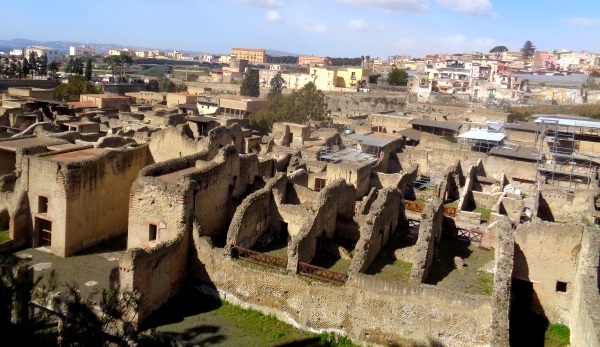 Like Pompeii, Herculaneum was partially excavated and can be visited. Many things are better preserved in Herculaneum than in Pompeii, but the place was much smaller. Herculaneum lies west of Vesuvius near the coast, between Naples and Pompeii. The excavation can be easily reached by train. Caution: In Italian Herculaneum means „Ercolano“. This is also the name of the modern small town next to the excavation and the railway station. Today the city has about 50.000 inhabitants, in antiquity at the time of the catastrophe there were about 4.000. So at that time in Herculaneum lived about 6 times less people than in Pompeii. Herculaneum was a port city, directly at the sea. After the volcanic eruption in 79 A.D. and the meter-high ash layer, the shore was shifted by more than 500 meters. Until today the excavation is about half a kilometre away from the sea. 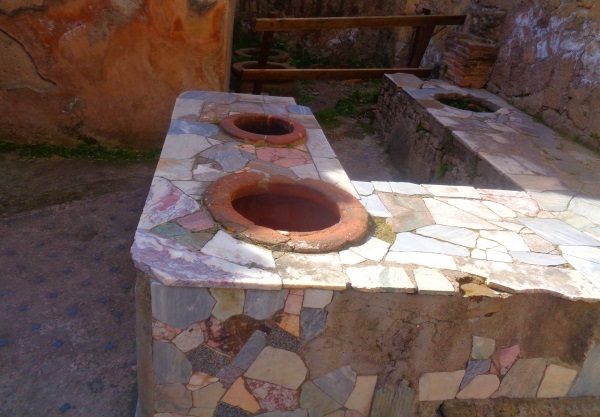 Many rich people lived in Herculaneum. Some of them were citizens from Rome who had a holiday home in the village by the sea. The probably larger part of the inhabitants was slaves. Herculaneum is only partially excavated. VIele parts of the ancient city lie under the today’s city. Thus, they would have to remove houses in order to further enlarge the excavation on a grand scale. Also the theatre of Herculaneum, for example, has not yet been excavated. Many scientists are of the opinion that they should leave also a part of future researcher generations. Then there are certainly even better techniques for archaeological excavations than today. In Herculaneum the ashes from the volcanic eruption were more than in Pompeii. The ash layer in Herculaneum is estimated to be about 20 metres, in Pompeii about 5 metres. Herculaneum was better isolated from the air due to the high ash content. In Herculaneum, in contrast to Pompeii, many ancient things are also preserved in wood. These include furniture, shutters and panels with inscriptions such as city laws and ordinances. Also a whole roof made of wood, a cot and much more are preserved. But most things cannot be seen on site, they were brought to the museum or stored. A large museum could be filled alone with the many wooden objects from Herculaneum. Food remains have also been found. For example, figs are exhibited in the National Museum of Naples. In recent years, research has focused on investigating the faeces of the inhabitants of the sewers. For example, it can be used to determine the composition of food. The bones of the 350 or so corpses found in Herculaneum are also examined in detail in laboratories. 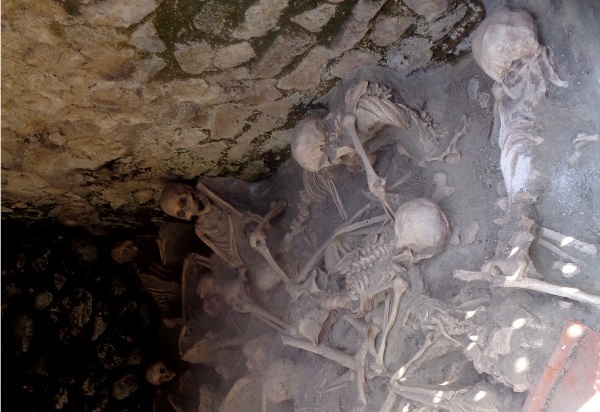 Nowhere else in the world have more ancient skeletons been found than in Herculaneum. The excavation is also much smaller than in Pompeii. But she has it all. Many pictures like mosaics are well preserved, even organic things like bread and other food from antiquity were found during the excavation. Especially the many mosaics are great, especially on the floors of different private houses and thermal baths and the murals (see picture). Rich people had large, elaborate pictures, poor people rather simple pictures. During the eruption of Vesuvius in 79 AD, Herculaneum was first buried by the mud wave, only then did the metre-high ash come. But Pomeji was only hit by the hot ashes. This is the reason why many things are better preserved in Herculaneum. Herculaneum was discovered 300 years ago, but the big excavation did not start until the beginning of the 20th century. In Herculaneum there were not too many public buildings. Most of the houses were private houses. It was a medium-sized seaside residence. Some house owners, however, seem to have been very wealthy. But there are also well preserved thermal baths, i.e. antique public baths. Many inhabitants fled at the beginning of the volcanic eruption, but many also stayed behind and died. The skeletons are still there today, as they were found. Mothers with babies in their arms and much more – interesting and very scary. Also shops and restaurants are often better preserved in the excavation of Herculaneum than in Pompeii. On the picture you can see containers for food in a kind of antique snack bar. In the Herculaneum, of course, many objects, statues and so on were found. As in Pompeii, most of it was used in the large archaeological museum of Naples. 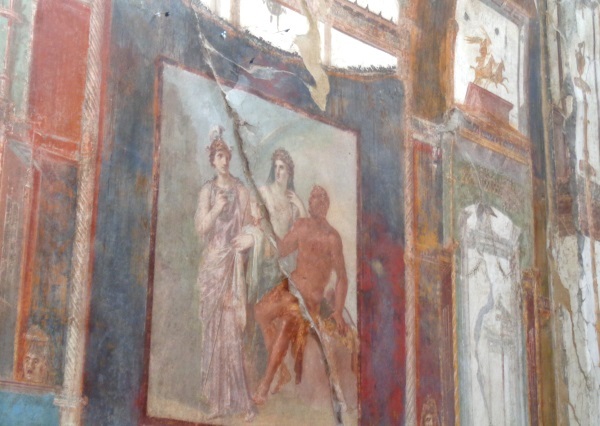 Many mosaics, pictures and other things can be seen on the spot in the houses of Herculaneum. There is also a small museum on the site of the excavation. Here, you also sees objects from everyday life in antiquity, like things for cooking or washing clothes. We found it very useful that we visited besides Pompeii also the ancient, sunken city Herculaneum. Many things are simply better preserved, for example there are also multi-storey buildings. Next to the museum above the excavation site is a bookshop with books and souvenirs on the theme. There is also a room with drinks such as coke, water and coffee from vending machines. From other machines you can get chocolate bars, chips and the like. The toilet in the museum was ok during our visit, also at the entrance is a clean toilet. The normal entrance fee for the Herculaneum excavation is 11 euros. Children under 18 years are free ! If you are between 18 and 24 years old, you only have to pay half (5,50 Euro). The small museum on the premises does not cost extra admission. Unfortunately you often have to wait in line for hours, the excavation is visited daily by thousands of tourists. Of course, this is especially true for the season. From our point of view, it makes sense to buy some more expensive tickets in the internet. These are tickets with preferential entry, thus without the long queue at the entrance. In summer (April to October) from 8:30 to 19:30. In winter from 8:30 to 17. These opening hours of the Herculaneum apply to every day of the week. Only 2 days a year are closed (1st Christmas Day and New Year’s Day). There is often a lot going on, it is worth buying tickets in advance on the Internet. The Circumvesuviana narrow-gauge railway stop is about 400 metres from the entrance. The station is called „Ercolano Scavi“. This means „Herculaneum excavation“. Two lines run here: The line from Naples to Sorrento and the line from Naples via Pompeii to Pomigliano. From Naples there are about 3 trains per hour, from Sorrento 2 trains per hour and from Pompeii city train station one connection. The other station of Pompeii „Skavi“ is located on the line to Sorrento and has about 2 connections per hour to the Herculaneum. From the station „Ercolano Scavi“ go straight down the street. After 400 meters you are at the entrance of the excavation of Herculaneum. The road is also signposted.